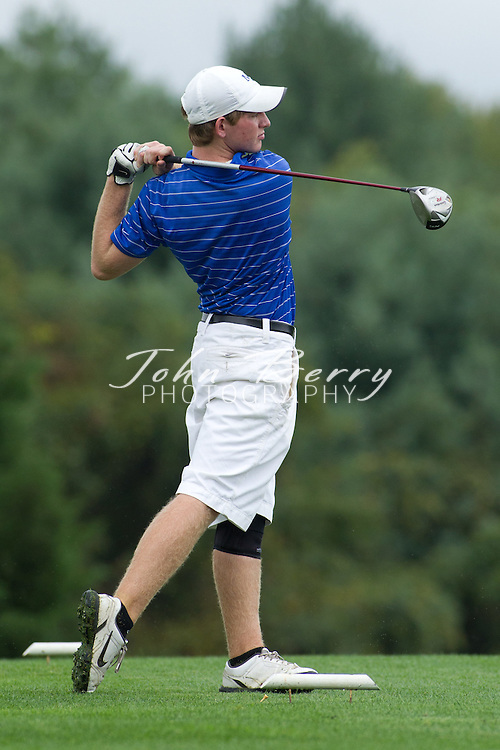 September/26/11: MCHS Golf. Bull Run District Tournament, with Madison, Strasburg, William Monroe, Manassas Park, Central Woodstock, George Mason, and Clarke. Greene Hills Country Club. The Golf team participated in the Bull Run District Championship yesterday at the Greene Hills Golf club and finished in 3rd place in the 7 team tournament. Austin Kelliher shot an 18 hole round of 79 to lead the Mountaineers. Kelliher finished 5th overall and was named 1st Team All District for his performance. Collin Tucker (83) finished 8th overall and was named to 2nd Team All District. Kevin Wells (89), and Jack Kemp (91) were the other scorers for Madison. Ryan Taylor (91) and Jake Sadler (92) also participated in the tournament. Kelliher, Tucker and Wells also qualified for the Region B Tournament at Falling River Golf Course in Appomattox on October 3rd. William Monroe won the tournament with a team score of 310. Central Woodstock finsihed 2nd with a 341 and Madison was 3rd with a 342. Strasburg (366), Clarke County (369), Manassas Park (375) and George Mason (408) were the other teams participating. ©2011 John T Berry | BerrySports.com. All rights reserved.